All of the pieces in this blog post I’ve owned for a long time, either a year or some even longer! So I thought for this post it would be fun to talk about some of the ways I take my older pieces and make them feel new or how I put an outfit together with those things! It’s no secret I love thrifted items and love to dress whimsical, so creating outfits with older pieces is always the most fun for me! I personally think it’s when I get the most creative because I’m not thinking about the way I maybe saw it styled on the model when I bought it, I’m thinking of it in a whole new way. This skirt is L’ecole des Femmes and it’s something I’ll keep for a long long time! 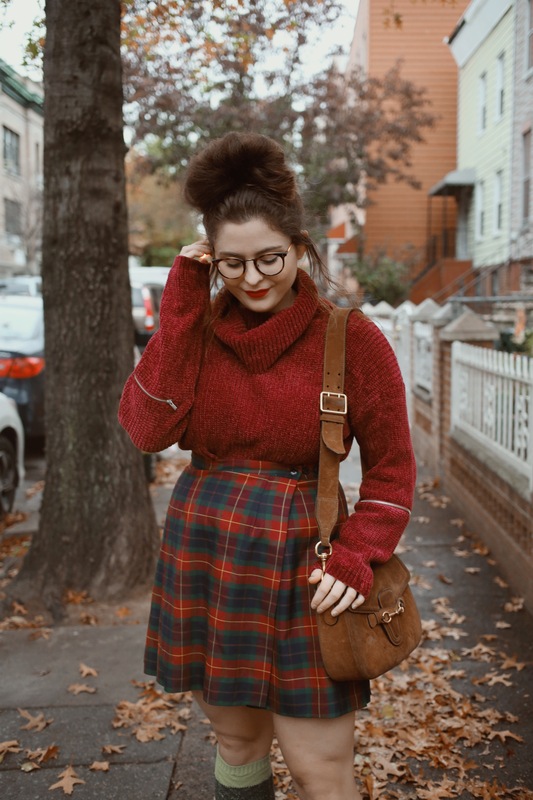 One of my favorite ways to wear plaid skirts in the fall is with a cropped sweater (just like this one!) and thigh high boots.. and since I don’t have dark green thigh high boots I decided to create a similar look with socks! Just a fun way to achieve something similar, but totally different! I got these socks from AE a year or two ago and love the color green they are so much! I paired the whole look with an older Asos coat and my Gucci bag I got a year or two ago that was my first designer bag ever! I’ll always love it so much. Love the fact that everything you are wearing is something youve had for a while. Being able to bring To bring them all together and make a unique outfit is so inspiring. I love finding new ways to use outfits that I’ve had in my closet for a while. I absolutely love that skirt, and I think you did a great job styling it. I love this look but moSt importantly your page! Your style is effortlEss and relatable i love it. Awesome job Doll! Xo. 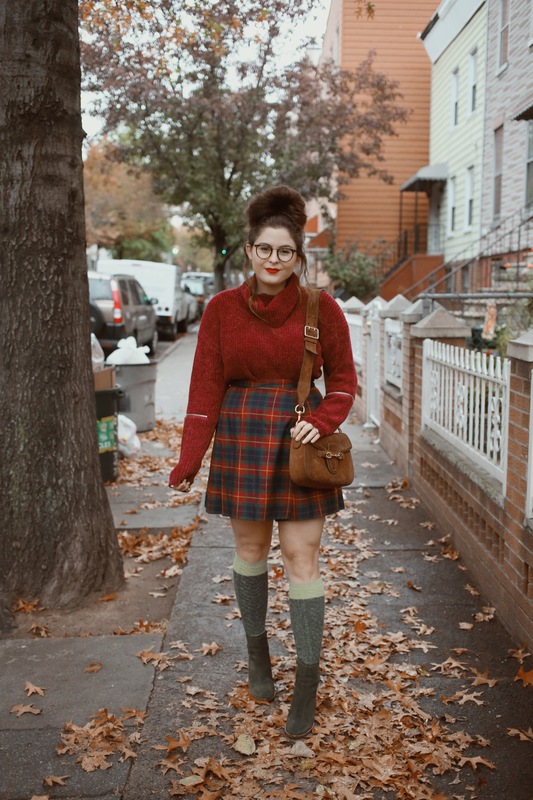 I never thought i could wear a skirt with Big cozy sweater until i saw the way you stYled it! I love It! So cute!! Thank you for this post! I always feel like i have to buy a new outfit to feel good about it but this post inspires me to grab sOme of my older Pieces and start getting creative. 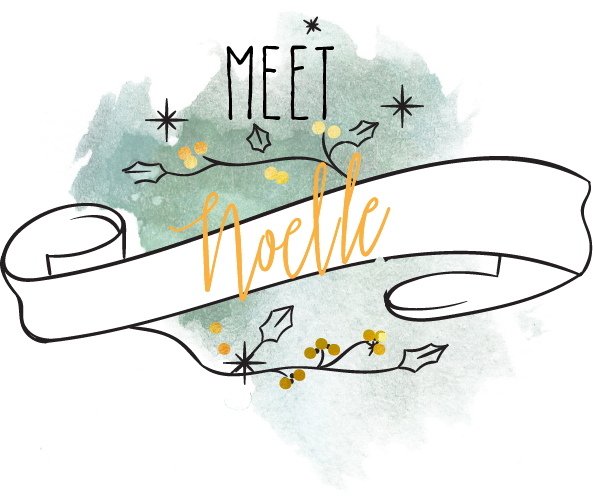 I love love love following you, Noelle! 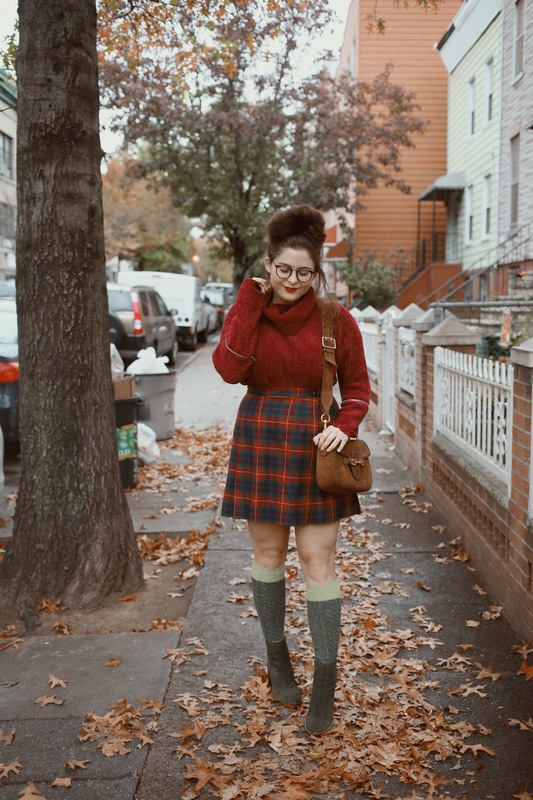 You’re such an inspiration to my little Instagram fashion blog 🙂 Love the tall socks with the plaid skirt, all the colors are perfect! I Love the boots and socks. Such a cuTe outfit. Thanks for linking ways to purchase similar pieces! As a source of inspiration, i really aDmire how you bleNd new and old pieces to create a fresh look! I want to pull everything out of my closet and rewOrk my olD pieces with the new Coat That ill be ordering from your link. Thanks for the fun read! You have the cutest outfits and home decore! 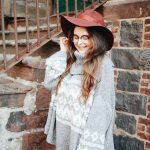 I love when bloggers restyle old clothes! 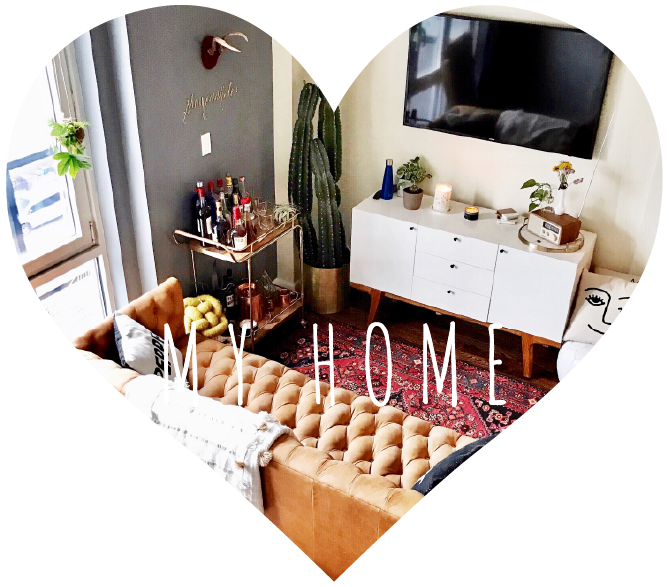 Love all your posts you, Your apartment and Pup are the cutest! Ahh! I never thought of pairing a crop sweater witH skirts! So cute! I really love tHE socks You sUggested in the link with the reindeeeer! Amazing! loooooooove the details on the sweater. fabulous, per usual! I love that feeling when you find old pieces in your closet that you are able to magically make feel new again. AlwayS such a wonderful job styling!! love love love the details on the sweater. fabulous per usual. Love the Knee-high socks. Too cUte.!! Its pretty much sweater weather, yay Dec. 1st!! aww this is such a cute look, its so nice to see someone promoting thrifting and reusing old favourites. i really love the vintage feel of the skirt! Love your sweater that zipper detail is super cute! Im so nervous about tUcking in a sweater under my skirt. But after seeing this look you are motivating me to try it. This is so helpful and interesring, since I can’t always afford to get something new! You really inspired me to get creative with what I already have now! 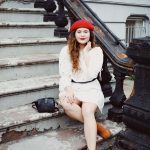 I just went back to school so i’m on a budget and i have also recently been styling a loT of older pieces in to new looks and it’ S making me love my WARDROBE all oVer again! Love this outfit! Especially thats its all older stuff that you already owned. I love seeing new stuff to buy but its nice to rethink what we already have on hand! Super cute!!! I want to make a skirt like yours!! I love to sew! Youre always dressed so cutely and I cant even! Youre an inspiration always! i love the way you tell a story with your unique outfits. It has really inspired me to try different styles. You are bold, with an amazing personAlity. Keep doing what you doing. okay so you are adorable and your outfits always just make me really happy- theyre just so cute and fun and beautiful and ugh. and when you post about duke!!! my heart. thank you for being such a light!!!! I love using my consigned/vintage pieces with my work look and i use your blog to help me keep it femine. I love thaT velvet is back!!! Hello! If just recently found you’re Instagram and now your blog! Its so beautiful and fun! I’m looking forward to scrolling through the gorgeous pictures! Also the SHOE giveaway about took my breath away! I think I need them in my life! Do I sign up by just leaving a comment here? Absolutely love this skirt! The while outfit is so seasonal, its amazing! I love the skirt and cropped water combo. Definitely something I’ll have to try. I love everything about this! You inspre me to wear more red ❤️ Such a power color! Ahh you are such an inspo! Curvy girls unite!! I love that you found creative beautiful ways to use what you already had! Its easy to feel like We always need to buy new clothes to Make a cute outfit, but its cool to see being creative to make a fashiona and un outfit! Love your blog. You are such an inspiration. 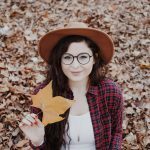 I just started my own blog and you are one of the people who inspired me to do it. I would love to win your boots. Finding ways to use old peices in my ClOset is so fun,, it bRungs thIngs new life! Being so tall, some thibgs turn into tunics vs dresses so it can be a fun challenge to restyle them as thnics or shirts LOL. I love this look! The best pieces are the onEs that you can wear for years and years (some of my fave pieces i’ve had for over 7 years!) That kind of longevity means the clothes are well-made and suit your style and shape – Total dream combo! all of these pieces are so you! That bag is KiLler! Love how you paired it. ahh I love your outfit so much! Red just looks absolutely Stunning on you wow. I am a very big fan of using what you already have for an outfit. Both creative and practical! The socks are probably my favorite idea. I think this may be one of my favorite outfits f om you! It is sooo clasically fall and you look absolutely lovely. Obsessed! 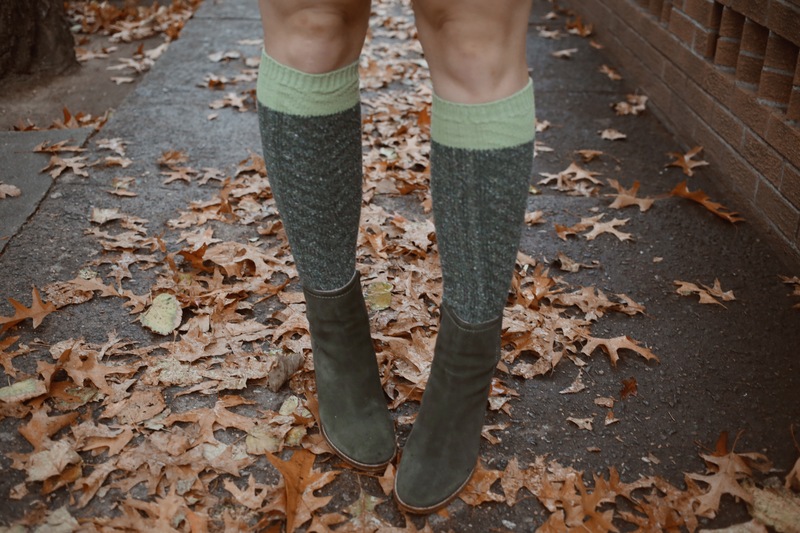 I love how you wore lower booties with knee high socks for a very stylish look (I’M DEFINITELY GOING TO ADD THAT ONE TO MY BAG OF TRICKS…!!! ). Also, this week I totally wore an outfit JUST like this! 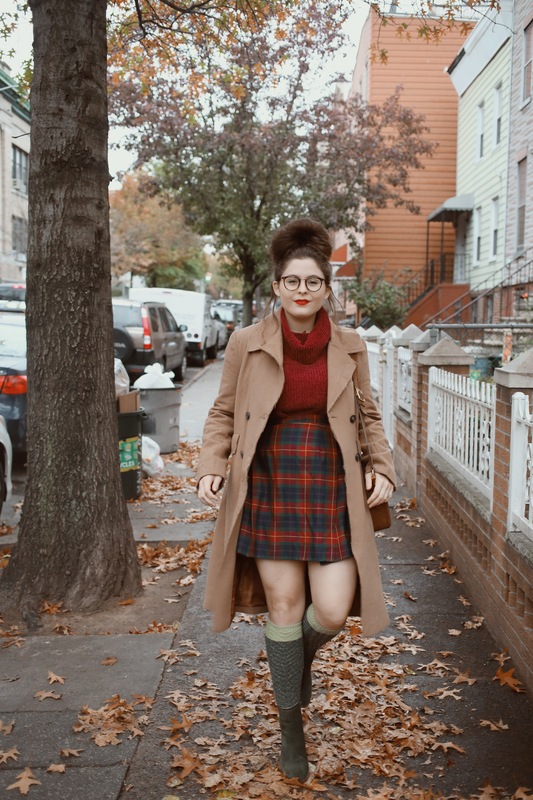 Turtle neck with plaid skirt…I just realized that it was probably entirely inspired by you. I thought I noticed my style increasingly improve since I started following you! Happy Holidays! I adore your style! I love going into my closet and revisting old items and giving them a new FresH, cozy Life! I’m constantly looking to Bring new life to my existing wardrobe. I would love to see a post about how you manage to store Your items. I hate that I hide my older items in my guest closet. So cuteeee. Im about to head over to the cozy sweater post. Your thumbnails are so effective!!! I love this plaid Skirt and its structure. I have one but its velcRo lol so thank you for posting options!!! It really resonalted with me hearing how you style things better when you didn’t just emsee them on the model! That also one one the reasons I live thrifting! It allows me to be creative without comparison. i love that red is your signature color! It brings out your features, like your eyes! Also, thank you once again for the Fashion inspiration! I love the way you styled these. ♥️ These pictures are amazIng!!!! SERIOUSLY obsessed with your style! Love getting outfit ideas FROm your blog! Keep posting more thank you! Also love the shoes and im a size 8! This outfit is the cutest! (As always) i Love creating new looks with pieces already in my wardrobe. You are such an inspiration! Love this combo. SomEtimes get nervous to wear bug bulky sweaters with skirts but you’ve inspired me to try again! This outfit is so cute! And that skirt is so precious on you! I love it! I adore your style. Noelle, This outfit is adroable! Love that you Integrate older pieces intonyour wardrObe. This has been one of my favorIte things to do since i was a kid. My mom was a fashion desiner so she always inspired me to think outside the box. I Learned early on how to take something Old and work blend it with new items, or upscale the piece and makiNg it truly unIque. this look + a hot toddy + giGgling with fRiends About harmless gossip = everything. You have such a timeless Style. I love it so Much. 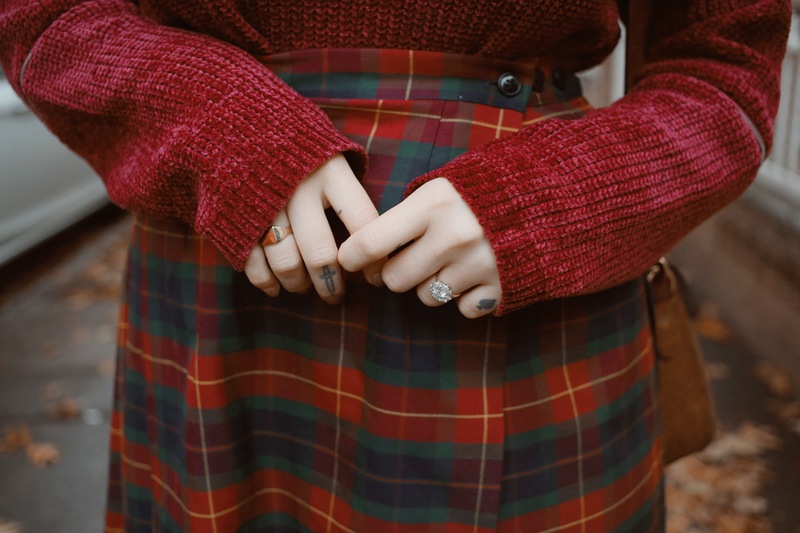 The red and plaid look gorgeous wiTh your Coloring and it’s Giving me some major outfit inspo! Love cozy socks in the wintertime! And i love that sweater. It looks so cozy, and the zipper details are perfect! AHHHH. I LOVE THIS. ThaNk you for showing everyone you can make it work with what you Got. We can be banging no matter what. Love this, Always a good idea to look at what you have with fresh eyes and maybe get some new inspo from some old pieces. This is something i’ve been needing to do with my closest. Even old clothes are kept for a reason, oldies but goodies. I Love The Idea Of Using Socks Instead Of Buying a New Pair Of Boots Just For An Outfit!!! Looking BEAUTIFUL As Always. What an adOrably festive outfit! 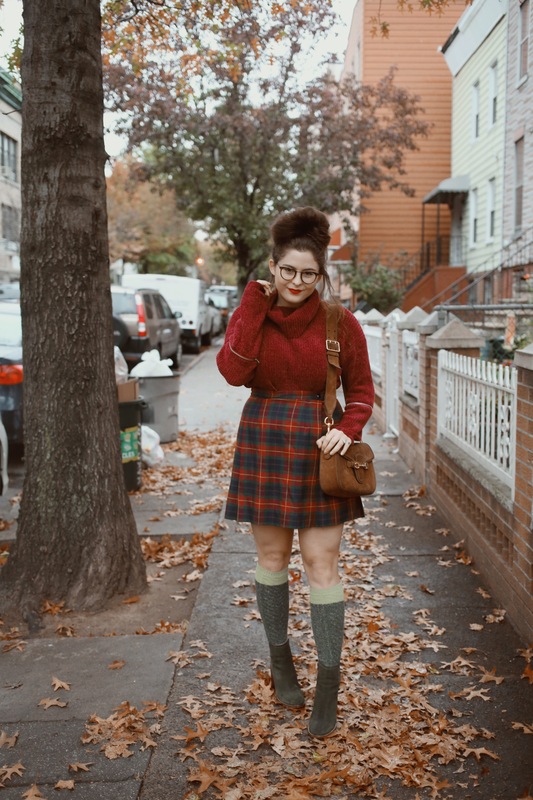 That skirt is what plaid dreams are made of! I am devastated its old, cause i habe been searching for a plaid skirt like that! It’s always so fun rediscovering old pieces you may have forgotten, and falling in love all over again! I always want to loom through my closet and find a way to make something ive had for ages feel new again! Thanks for sharing, im gonna go rummage through my closet!! The socks and booties are fab together! I Love this look! i think a trench coat is going on my christmas wish list. Your christmas poSts are everything and i love to be inspired by you! Love this post! Something i need to work on, mixing pieces. You are such a beautiful lady! I’m INSPIRED. I love Getting creative with my clothing! My favorite thing is going to a thrift store and finding a really unique find. One time I bought a pair of shoes with a portait painted on. love this idea! You arE so creative and have the best style. Perfect outfit as well! 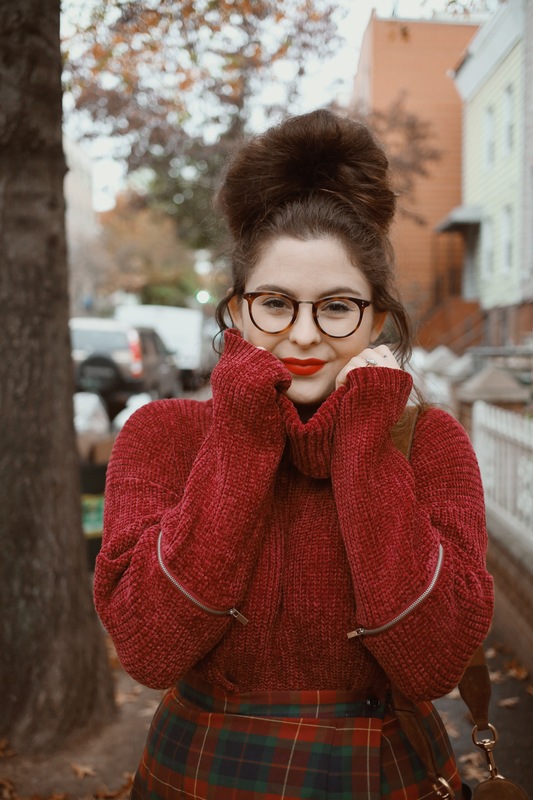 I have so many tuRtlenecks and have Been wondering how to incorporate them into outfits for this fall!! Love this look! So cuuute ! It reminds me of My time in scotland ! Lovely ! Hope to see more ways of styling the plaid skirt in the future. AlSo, more detail shots! ThE close-up of your Rings is my fave picture of the set. The colors are so gorgeous! Oh my goodness i am obsessed with your style!!! 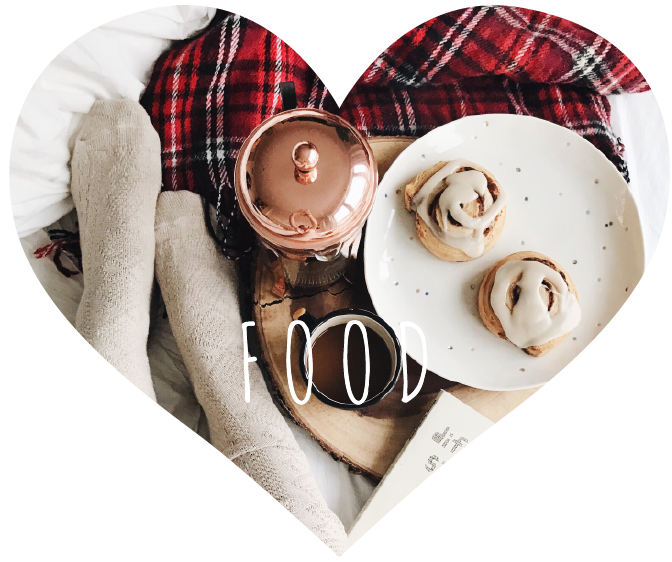 I love reading your blog posts! When i get the email that youve posted something new i get super excited! I really love the outfit youre wearing in those pictures and i want to find something similar or get some of those pieces! Im oBsessed with your style and love this outfit so much! Id love to get a similar outfit or even some of the same pieces. Your clothing really inspires me. I love getting the emails Telling me you posted something new on your blog. HEY GIRLIE, I LOVE HOW YOU ALWAYS FIND CUTE AND NEW IDEAS WITH ALMOST EVERYTHING! ♥️ I TOO LOVE TO MIX AND MATCH WITH OLDER ITEMS AND THE OUTCOME IS USUALLY SUPER ADORABLE. I ADMIRE THAT YOU FIND NEW WAYS TO DRESS CUTE WITH OLD OR NEW. 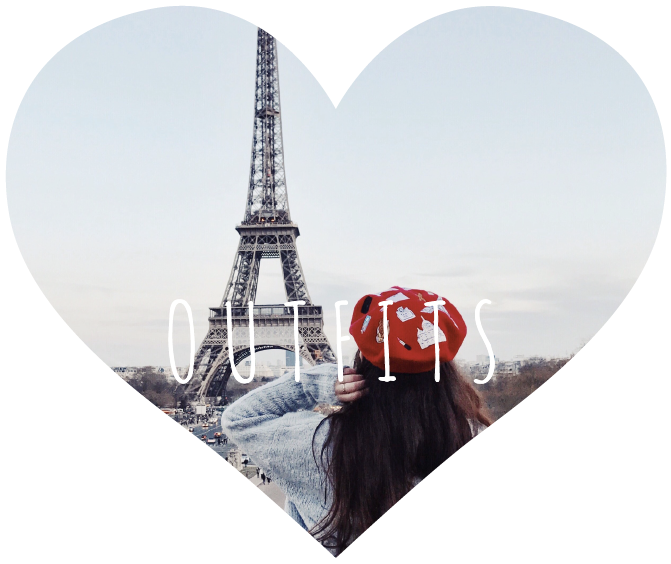 AND OF COURSE IM ABSOLUTELY IN LOVE WITH YOUR BLOG! STAY SWEET AND BEAUTIFUL ALWAYS ☺️ YOU INSPIRE MANY! Absolute perfection as always! I need to master your top knot one of these days! Yes! 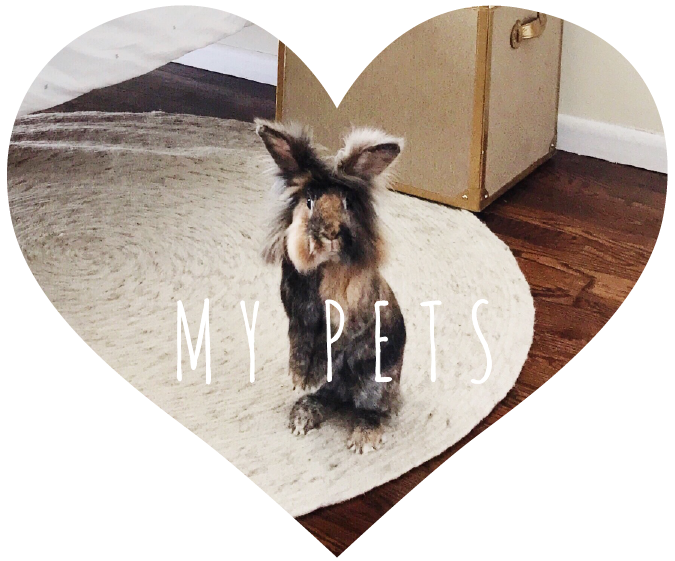 So cutE – i’m obsessed wIth thrifting And find the best steals that way. Plus, it’s always so much more unique! I love that you have your own style. You are beautiful and i wish to have my dream apartment like yours some day 🙂 || your outfit is so pretty bu the way. I love the Sweater is very cozy. Your style Is so stinking cute snd very inspiring. Love it. Buying fast fashion and Getting more wear out of the clothes i already own and this is sUch a cute outfit! I personally love how all the outfit looks like! You look lovely and i like What you said about how trYing to create new looks with the old helps to expand your creativity! ToTally agree with that! I love following you on instagram and seeing all your Trendy and cute outfits. 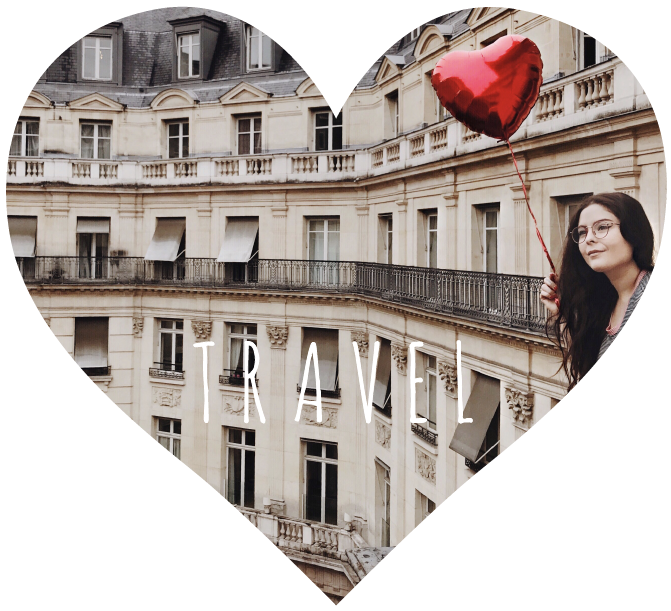 I swooned watching your engagement proposal in PaRis, ughhh so cute!! You are always providing me with cLothing iNspo. lovely every time! Love your originality. This is a great holiday outfit! Love the zipper detail on the sweater – so cute! 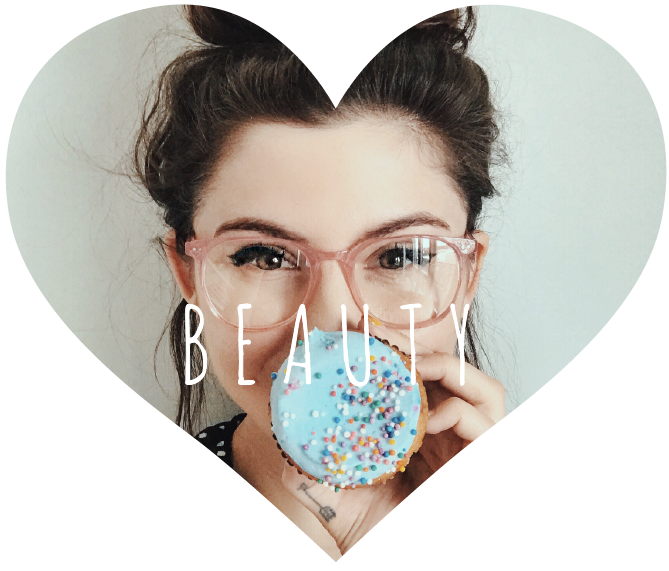 All the cutest and style inspo extreme! Ahh! That sweater is suPer cute and looks so cozy for christMas. I love it. I love a good plaid skirt! Such a cozy outfit without it being “winter frumpy” I love it! This look is lovely!!! I should try to pAIR SKIRTS WITH KNITTS MORE OFTEN ^^.